It’s the Christmas event season once again and for Image Production Services that means they’re heading south to Colombia, South Carolina to produce the annual Nutramax Christmas party. 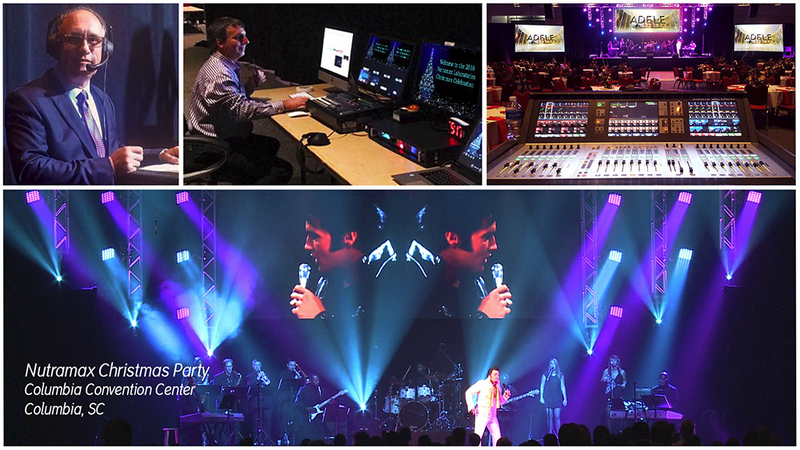 In the past, Image has provided flawless event production along with world class entertainment, from Cirque Dreams Holidaze to many acts that have appeared on America’s Got Talent. This year, show producer Michael Yorkell did not disappoint by assembling an outstanding cast of live tribute performers straight from Las Vegas. This elaborate production featured live performances portraying superstars such as Garth Brooks, The Four Tops, The Blues Brothers, Adele, Rod Stewart and, of course, the king Elvis Presley. These acts were met with an enthusiastic reception. Image Productions lighting director, Tyler Lussier, designed the entire production integrating an outstanding lighting design with customized video content to create exceptional results that Nutramax could be proud of.